This pattern makes a sweet cuddly stuffed dog. 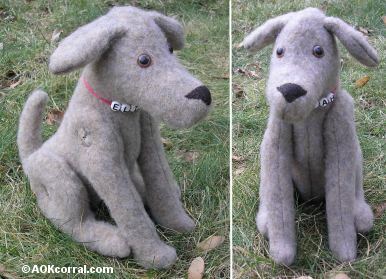 You can make the dog in your choice of color and fabric and have the option of making a cute dog coat for him too. The patterns for this project are available for only $2.49. The pattern download includes the dog pattern with sewing instructions and the dog coat with instructions. Be sure to transfer the markings for the positions of the eyes, ears and legs onto the fabric before going on to the sewing. The best method of transferring is to thread a needle with a piece of contrasting thread color, send it into the fabric and back out again at the point you wish to mark leaving short tails of thread at that point. The threads will be pulled out easily when you do not need them anymore and there will not be any markings on your finished dog. Match pieces right sides together and secure with a pins. Carefully stitch together each of the dog pieces along the stitching lines (approx. ¼ inch from edge) as shown in the patterns. Secure the beginning and ending spots by stitching back and forth an extra time. Clip a tiny hole at each of the marked eye locations, insert and secure the eyes. Fill the dog’s body with fiberfill stuffing as much as you desire for a softer or harder body. 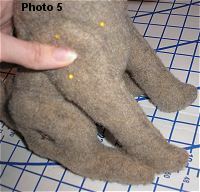 Fill the dog’s front legs with enough stuffing to make them stiff. 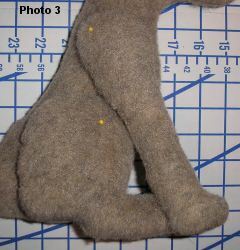 Fill the dog’s back foot with stuffing so that it is stiff like the front legs but only put a small amount of stuffing in the round part of the back leg. That part of the leg should remain mostly flat for a correct look. Do not fill the ears. Turn the seam allowances inside at each opening and stitch the openings together with small stitches. Leave the ears until later. Thread your long needle with at least 12 inches of embroidery thread in a color to match the buttons. First, position each of the back legs against the dog’s body matching the center connection points and hold in place with a few long pins. Next, lay a button at the center connection point on one of the dog’s back legs. While holding all the pieces in place, send the needle and thread through the button, first leg, body, second leg and out at the center connection point of the second leg. Slip another button onto the needle and slide it on until it is laying up against the second leg’s connection point. Pull the thread leaving several inches of the end at the entrance point. While still holding all the pieces in place, send your needle and thread back through a different hole in the button at the center connection point of the second leg, body, first leg and a different hole in the first button. Pull all loose thread through. Attach the front legs next. Attach the front legs the same way that you attached the back legs. Turn the top ¼ inch of the opening of one of the ears to the inside, stitch the opening closed with small stitches. 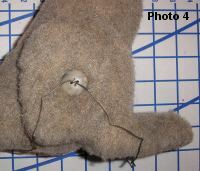 Position the ear onto the head and stitch into place along the top edge with small stitches. Place the nose piece onto the dog’s face. The center point of the triangle should line up with the stitching line that is below the nose. Stitch in place along the edge of the nose. For the name collar simply cut a piece of string, yarn or embroidery floss that measures about 7 inches long in the color you desire. Thread a needle and string all the letters of the name on in the correct order. Remove the needle, rap the collar around the dog’s neck and tie a knot at the back of the neck. Trim the ends of the string. 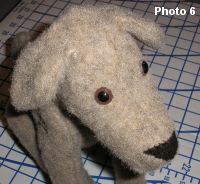 Make several of these dogs in a variety of colors or styles of fabric for a cute kennel of dogs. Do you have a dog? Try our How to Make a Dog Coat project!